When Jacques Thienpont visited this estate in the Côtes de Castillon during the harvest of 2015, he was immediately struck by the great location and the stunning view, perched at the end of the limestone plateau that runs eastwards from Saint-Emilion. A Belgian couple, Stéphane and Béatrice Goubau, had owned the château for a decade and named it after their family: “Château Goubau”. During this time they converted the estate to organic farming. It comprises 10 hectares of vineyards surrounded by woods and pastures; a varied and rich biotope, situated at a height of 100 m on the Saint- Philippe-d'Aiguille plateau, the highest point of the Bordeaux region. With his sister, Anne De Raeymaeker, Jacques decided to purchase the estate as an investment for the two branches of the Thienpont family who are close. The following year in 2017, the families had the opportunity to purchase the neighbouring domain, Château Montagne, a 25-hectare estate with an impressive château including the potential of planting a further 10 hectares of vineyards. The families hired Maxime Thienpont, their nephew who had grown up at another family estate Château Labégorce Zédé in Margaux as manager and renamed the property L’Hêtre (the name of a beech tree in French), thus continuing the arboreal theme that Jacques has used for all his estates. The vineyards enjoy good southeasterly exposure, a continuous gentle breeze and are divided between the limestone plateau and a mixture of clay, limestone and chalk soil slopes. The wines are fermented in concrete and oak vats and aged in a mixture of one-third new oak, one-third one year and one-third second year barrels. Although the Thienponts aged the 2015 vintage, the 2016 vintage was the first made entirely by the new owners and is therefore the first to carry the new name: L’Hêtre. The artwork for the labels was created by Belgian artist, Anne van Herreweghen. 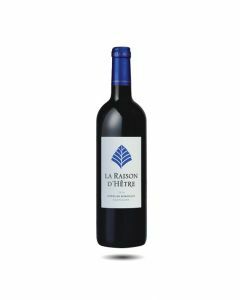 La Raison d’Hêtre, the second wine, is a blend of 95% Merlot and 5% Cabernet Franc as well but from the young vines and from the parcels of clay-limestone on the lower slopes. It has a pretty dark violet colour, is round and fresh with red fruit aromas. Its taste is lively and spicy with attractive fruit/tannin balance.